Most people in the UK do not read books. Shocking, I know, but it’s what many people have told me. I might read books, my wife might read books, both of our families might read books, and pretty much all of our friends might read books, but nonetheless, apparently, most people don’t read books. It’s not a nice thought for an author to try and wrap his brain around, but enough people have told it to me that I’m inclined to believe it to be true. And then, last Monday, we moved. We went to a website, told it that we had a three-bedroomed house, and it told us what type of van a typical three-bedroomed house requires. One button click later and we had a bunch of quotes to select from. Can you spot the flaw in our methodology? See the picture at the right of this paragraph? 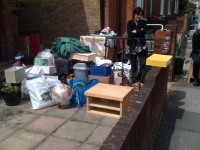 That’s what was left after the removals guys had filled their van to its very brim and set off for Brighton. TV, laser printer, unit that laser printer sits on, an even bigger unit on the pavement that the TV sits on, bin, globe, lamp, pictures – but I’ll stop there because this isn’t the Generation Game and you aren’t memorising this list for prizes. But I will mention that the picture doesn’t show the three bikes that were still in the back garden at that point. Perhaps that website’s typical three-bedroomed household doesn’t include seventeen large boxes of books?